Eyes are windows through which an animal can see the visual structure of its environment and obtain information to control its behaviour. The visual world as observed by a human eye is very familiar to most of us, but the eyes of most animals, from other primates to invertebrates, perceive a very different view of the world. For instance, resolution, sensitivity, and spectral reception all vary widely between mammals, and properties of light which we cannot observe directly, such as its polarisation, are detected and utilized by many invertebrates. Yet without the ability to directly question other animals, it is sometimes difficult to gain insight into their visual perception of the world. 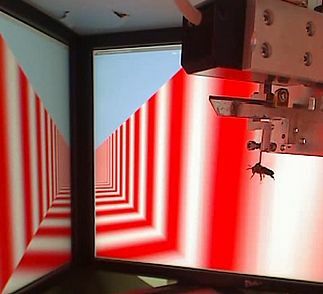 As the sensory input for visually controlled behaviours, the eye’s structure, from its optics to the photoreceptors, dictates how its owner sees the world, and measurements of the geometry of these components can be used with optical simulations to provide a good approximation of how an animal sees its environment. My post-doctoral research in the Vision Group at Lund University has focused on using microtomography to build 3D models of a range of insect eyes, with the goal of using these models with ray-tracing techniques to simulate an insect’s view of its environment. 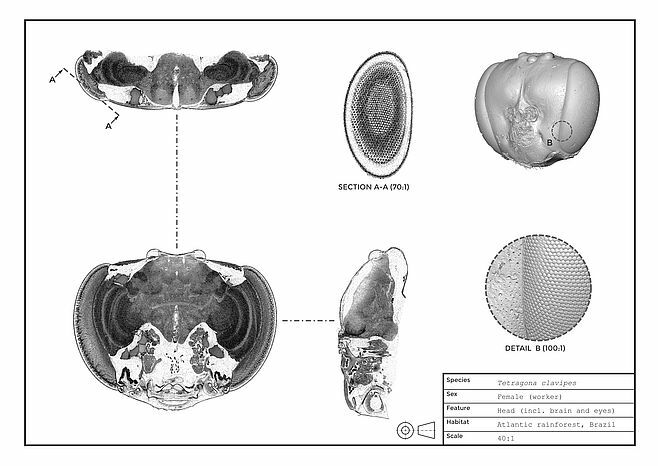 A volume rendering from microtomographic data of the large eyes and the brain of the hoverfly Eristalis tenax. Insects have two types of eyes: simple eyes, called ocelli, which are composed of a single lens and a retina of photoreceptors, and compound eyes, where an individual lens focuses light through a light guide onto each photoreceptor, forming an optical unit called an ommatidum. With the relatively limited number of receptors in most insect eyes of both types (typically hundreds to thousands), simulating insect vision initially seemed like an easy task when compared to higher resolution human vision, yet this project has presented many challenges. 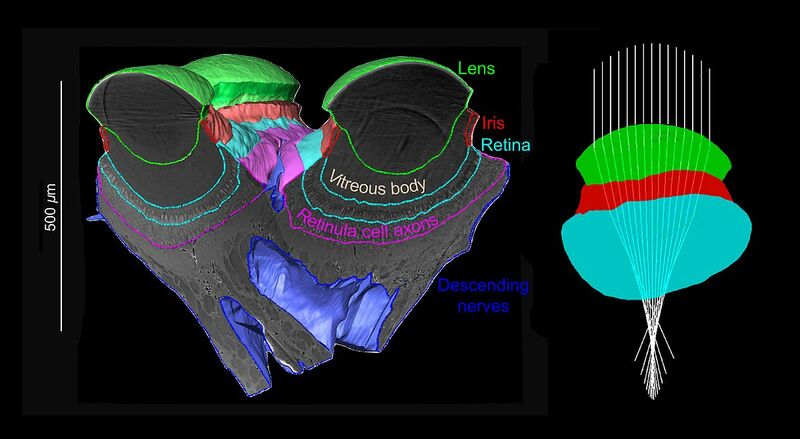 For instance, many methods of investigating insect (and also vertebrate) eyes reduce their inherently 3D structure to a 2D representation, such as histological sections or flattened retinal whole mounts. Microtomography provides an effect method to image the complete structure of an eye in its original 3D form, and with correctly prepared samples, allows details from the gross shape of the retina down to the fine structure of its photoreceptors to be imaged. The next challenge is to label and segment the shape of each structure within the 3D image of an eye; while labelling large structures such as a complete lens volume can be completed manually, segmenting the individual details of a thousand ommatidia in 3D is very laborious! To assist with segmenting these fine structures, I am currently developing a semi-automated method to detect the position, orientation, and size of each individual ommatidia in compound eye. Finally, when the structure of the lenses, irises, and retina of an eye are segmented, I apply a customized ray-tracing algorithm to calculate how light from the world is focused into the eye, the results of which indicate its field of view, and the resolution and sensitivity of receptors across the eye. 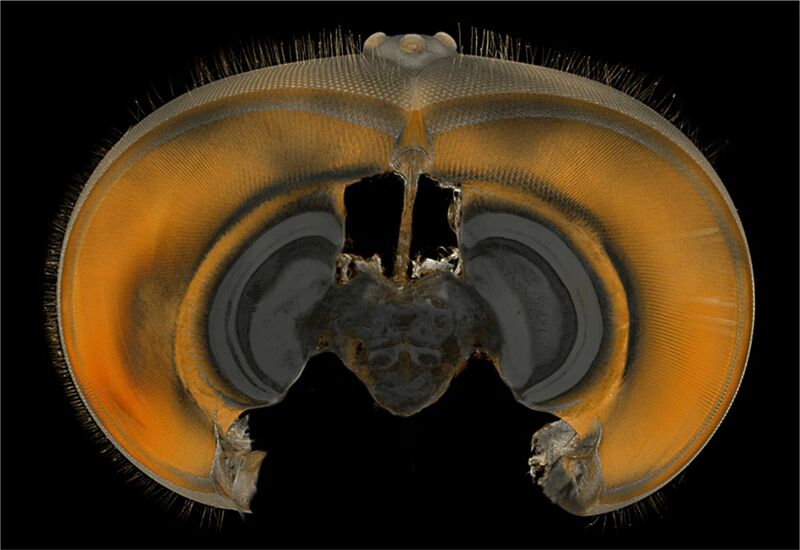 Left, the segmented 3D structures in the simple eyes (ocelli) of a tropical orchid bee (Euglossa imperialis). Right, using the segmented structure of the lens, iris, and retina from an ocellus, light rays from an on-axis point source are traced, showing the focal point of the lens is behind the retina. Utilizing these 3D imaging and optical simulation techniques, my research focuses on how different insects have evolved eye specialisations based on the various visual environments they inhabit and the different visually guided behaviours they perform. I have primarily investigated the eyes of various bees, which offer a range of interesting comparisons as species vary substantially in size, habitat, activity times, and sociality. For instance, do the eyes of species that live in different habitats and perform similar behaviours have more in common than those that perform different behaviours but live similar habitats? A question that I am currently investigating is what visual trade-offs, in terms of varying sensitivity and resolution, occur as the eyes of a bee are limited by its body size (as larger bees tend to have larger eyes in general), and whether similar trade-offs occur in variously sized bee species from tropical and temperate forests. A simple virtual environment I used during my PhD to measure a bee’s response to a simple visual stimulus representing movement through a tunnel. 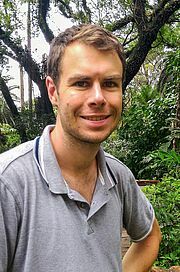 While my current research focuses on modelling the anatomy and optics of insect eyes, I originally studied mechatronics engineering during my undergraduate degree at the University of Queensland, Australia, where I was trained in electrical, mechanical, and software design techniques. After several work placements in the manufacturing and processing industries around Brisbane, I transitioned to Biological research during my doctoral studies at the Queensland Brain Institute, also at the University of Queensland. My PhD project involved applying methods from control systems engineering to characterize how bees utilized information from a virtual environment to control their behaviour, and aimed model and predict their response to stimuli. I believe that my initial training in engineering methods has been invaluable to my biological research, firstly, because a strong background in programming and computational methods has assisted in processing most forms of data I have obtained, and secondly, because systems analysis approaches have proved fruitful to model and gain insight into the biological systems I have investigated. For instance, during my PhD, I essentially treated bees as a ‘black box’ to be described (within the scope of some biological variability…) by a relationship between sensory input and motor output, and my postdoctoral studies have aimed to ‘unpack’ part of that box, by providing a model of the output of a bee’s eye from its view of a scene. An optical model of a bee’s eye will then allow a more accurate model of the remaining elements of the organism, particularly its neural processing, to be developed. A depiction of the eyes and brain of a tropical bee in the style of an engineering drawing. To date, my academic career has spanned several disciplines, and I have enjoyed learning the new techniques and ideas associated with each. While working with tomographic imaging, I have also found that crafting visually appealing images for scientific and general audiences is both enjoyable and rewarding, and I hope to have time to pursue this in the future. With my research progressing from studying bees’ behaviour to studying their eyes, a natural progression is to move towards studying the neural circuitry that processes visual information. Preliminary tests show that x-ray tomography provides a useful method to reconstruct the gross structures of an insect brain while maintaining its relationship to the sensory structures on the head, and further work is likely to allow contrast to be selectively applied to individual neurons, which will provide insights into the neural circuits underlying visual processing. Ultimately, developing models of the eyes and brains of insects will provide insights into how these animals are able to perform challenging visually guided tasks with their relatively small optical and nervous systems.